Pope Francis officially defrocked the disgraced former cardinal of Washington, D.C., Theodore McCarrick on Friday, following a secret Vatican tribunal into allegations that he molested a 16-year-old boy decades ago. "On 11 January 2019, the Congress of the Congregation for the Doctrine of the Faith, Theodore Edgar McCarrick, Archbishop Emeritus of Washington, DC, Guilty of the Following Delicacies while a cleric: solicitation in the Sacrament of Confession, with the aggravating factor of the use of power," a statement from the Vatican on Saturday said. "The Congress imposed on him the penalty of dismissal from the clerical state. "On 13 February 2019, the Ordinary Session (Feria IV) of the Congregation for the Doctrine of the Faith considered the recourse and presented against this decision," the Vatican's statement continued. "Having examined the arguments in the recourse, the Ordinary Session confirmed the decree of the Congress. This decision was sent to Theodore McCarrick on 15 February 2019. The Holy Father has recognized the definitive nature of this decision, made in accord with law, rendering it a res iudicata (ie, admitting of no further recourse)." 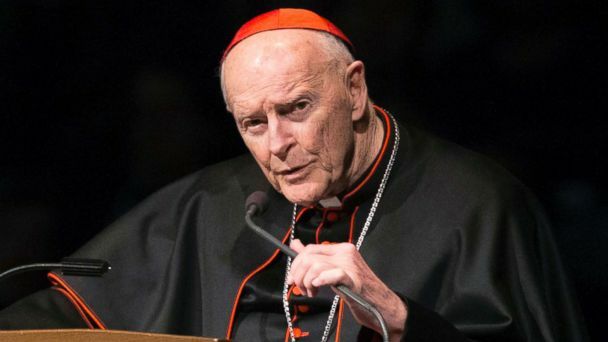 McCarrick, 88, resigned from the College of Cardinals last summer at the pope's insistence, but only after an accusation that he molested a 16-year-old altar boy while serving at the Archdiocese of New York was found credible by the church. A July 2018 report from The New York Times alleged that McCarrick coerced seminarians into sexual relationships. By announcing the sanctions against McCarrick, the church had hoped to send a strong message ahead of next week's unprecedented global summit on the protection of minors. But it's unlikely that many critics will be satisfied. Archbishop Carlo Maria Viganó and others say church leaders have known for years about allegations that McCarrick was a well-known abuser of seminarians and priests, but chose to turn a blind eye. In a bombshell open letter last August, Viganó even called on Pope Francis to resign. "Laicization," the term the church uses for revoking a priest's ordination, is considered the most severe penalty possible under the circumstances. McCarrick was already the first cardinal in a century to forfeit his red hat. Pope Francis demoted McCarrick last summer after investigators for the Archdiocese of New York determined the charges against him were credible. McCarrick is reported to be living a life of penance and seclusion at the St. Fidelis Friary in Victoria, Kansas. The friary is one block away from an elementary school, a decision some survivors of sexual abuse have called "reckless." The Bishop of Kansas City Gerald Vincke told the Kansas City Star the disgraced ex-cardinal posed no threat to the school. "McCarrick is not allowed to make any public appearances or visit the school or do any ministry," he said. Next week, Pope Francis convenes a worldwide summit to address the issue of protecting minors from sexual abuse. New waves of the scandal have called attention to the church's failure to be fully transparent or to police bishops accused of covering up past abuses. Law enforcement agencies in the U.S. have recently adopted a more aggressive stance on the issue after last summer when a grand jury in Pennsylvania disclosed the names of more than 300 alleged predator priests going back decades. The scandal prompted the resignation of McCarrick's successor in Washington, D.C., Cardinal Donald Wuerl, who was Bishop of Pittsburgh during some of the period covered in the grand jury report. Now, other jurisdictions are following suit. Lawmakers in New York recently voted to extend the statute of limitations for child victims in civil and criminal cases despite objections from church officials. In Texas, law enforcement recently raided the office of Cardinal Daniel DiNardo, the head of the U.S. Conference of Catholic Bishops who will represent the U.S. at next week's Vatican summit.